Many chicken experts are becoming concerned about the impact that medicated water and feed are having on antibiotic resistant diseases on the small family farm. Animals get diseases in all settings, and a poorly managed free range deal is likely more pathogenically prone than a moderately managed factory farm. Antibiotics and vaccines have a surprisingly active presence on small chicken farms. Marek’s disease, coccidiosis, bumblefoot, Newcastle disease, coryza, straddle leg, necrotic enteritis, worms, maggots, fatty liver, fowl cholera, egg bound, chronic respiratory disease, gapeworm, fleas, lice, scaly leg mites, nest mites, diarrhea, botulism, winking disease, crop bound, blackhead, hexamita, giardia, fowl pox, infectious laryngotracheitis (ILT), avian metritis (E. Coli), bird flu, crusty face, and whooping crud. Etc. Some of these problems are caused by free-range confinement (I know that sounds like a funny term but it’s what most small farms practice) and some are just what chickens have to deal with irrespective of human meddling. Either way, the upshot is a reminder of an important historical anent: the more time we spend around animals—and certainly the more we breed and eat them— the more we expose ourselves to animal-human, or zoonotic, disease transmission. We tend to be microscopic thinkers on this matter (trust me you’ll hear sustainable foodies say that my flock of [insert boutique breed name here] has never been sick). I recall, for example, writing a piece in The Atlantic years ago highlighting the disease profile of free range chickens and having Barry Estabrook, in response, test his handful of chickens for Salmonella as a way to prove my claim wrong. That’s kind of the level of rigor with which this argument now plays out. But, evidence to the contrary notwithstanding, the fact remains that the fewer animals—wild, domesticated, feral, or in Eastbrook’s backyard— we come into contact with (and certainly the fewer we eat), the better off and safer we are. This is not a green light to start killing animals. It’s just a plea to stop breeding them. The fact that the vast majority of diseases that have ravaged human populations has historically come from animals—many of them domesticated— should play a dominant role in the vegan’s evolving strategy of argumentation. We know all about superbugs coming from factory farms in response to the stream of antibiotics being poured into them. But how much do we know about the role of antibiotics and vaccination on smaller farms? Not much. But from what I’ve read, many chicken experts are becoming concerned about the impact that medicated water and feed are having on antibiotic resistant diseases on the small family farm. Animals get diseases in all settings, and a poorly managed free range deal is likely more pathogenically prone than a moderately managed factory farm. Antibiotics and vaccines have a surprisingly active presence on small chicken farms. There’s also the concern of what happens when animals eat animals and then humans eat those animals. This brings hunting under the gun. As David Quamman recounts in his new book Spillover: Animal Infections and the Next Human Pandemic, the SARS virus can be traced back to the Guangdong Province of China, a place teeming with “ravenous, unsqueamish carnivores” whose taste for all manner of exotic flesh drives one of the most diverse wild animal markets in the world. This free-ranging palate matters because it was the human consumption of a civet, which had contracted SARS from a horseshoe bat, that sparked a global health panic in humans. The more we condense natural environments and, in turn, cram animals into adumbrated ecosystems, the more hunting becomes like Russian roulette. Needless to say, a lot human-animal interaction is practically unavoidable. No matter how we behave, mosquitoes will always be capable of killing us, sometimes with alarming efficiency. 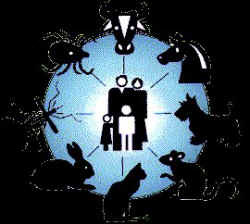 It is for this reason, I’m afraid, that as we develop an ethics of zoonosis, ethical vegans may have to consider drawing some lines they do not necessarily want to draw. I can easily foresee someone with a more refined philosophical mind than mine making a convincing case that there’s a sufficient competing moral consideration to ethically justify gassing mosquitoes into submission. But that’s a fight for another column. For now, Quamman’s leading conceit is that we are, for reasons having to do with our contact with animals, on the verge of the Next Big One. The fact that it will most likely come to us zoonotically renders all the claims and excuses for hunting, raising animals on small settings, and whatever other non-industrialized alternative you come up with moot. Merely by bringing more animals into this world, confining them in one measure or another, and meddling with the balance of preexisting ecosystems in order to raise and eat animals, we place ourselves in grave danger vis-a-vis the animal world. And while it would, I suppose, be a dark form of justice if animals did us in, it’s one form of justice I’d rather avoid.